Jody Houser’s run on Amazing Spider-Man: Renew Your Vows was a charming, bubbly story about a superhero family firmly settled into its fantastic circumstances, but nothing could prepare the Parkers for the multiverse-shattering conflict that comes their way thanks to the Spider-Geddon crossover. As mentioned in last week’s Spider-Force preview, the best part of alternate universe events like Spider-Verse and Spider-Geddon is discovering different Spider-Heroes and seeing how they interact. Spider-Girls, written by Houser with art by Andrés Genolet and colorist Tríona Farrell, doesn’t introduce any new characters, but it soars when it comes to the interactions, taking advantage of the places where their stories intersect to deepen relationships. 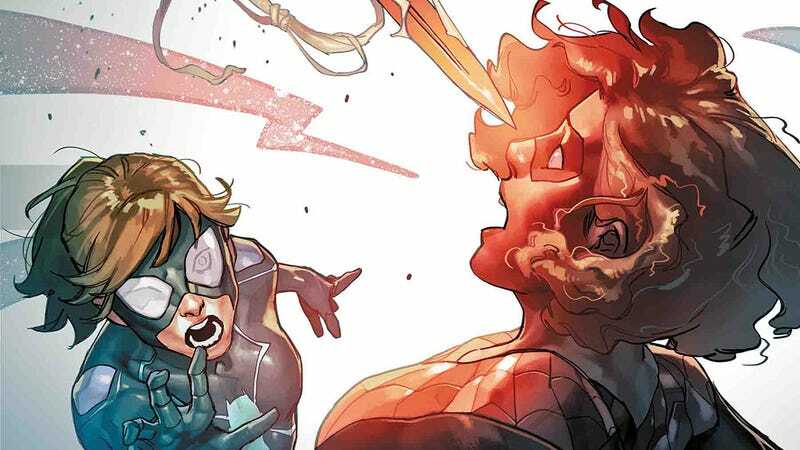 In the case of Annie and Mayday Parker, their connection gains a new dimension when Annie realizes that Mayday is the alternate universe version of the daughter Annie’s parents lost before she was born. This exclusive preview of next week’s Spider-Girls #2 delves further into Annie and Mayday’s connections by looking at their connections to Normie Osborn. They expect fellow Spider-Girl, Anya Corazon, to have similar ties, which leads to comedic moments where Anya points out that her separation from the Parker bloodline keeps her out of the loop on a lot of this stuff. The artwork in Spider-Girls is particularly excellent, matching the fun-loving spirit of Houser’s script while still capturing the high stakes of this superhero adventure. Genolet’s slick linework is a great fit for these agile heroes, but he also delivers rich expressions that make the personal aspects of the story more engaging. Farrell’s soft yet vibrant coloring adds dimension to the inks and reinforces the lighter tone, and the art brings a lot of personality to Houser’s story.